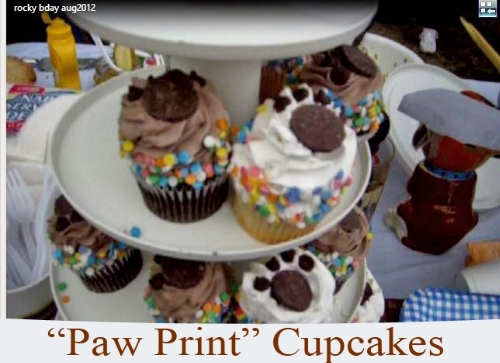 Vanilla cupcakes topped with chocolate paw prints. That’s one dog-themed dessert we had for our (people) guests at our beagles’ birthday party. The time will come for you too when your dog’s birthday arrives. It’s a personal choice. But if you’ve thought of hosting a first birthday party for your dog… or celebrating your adopted dog’s first year with your family… or if the idea is new to you but intrigues you, then, these tips and ideas can help. 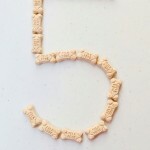 They’ll help you plan for, and prepare a memorable doggy birthday party. 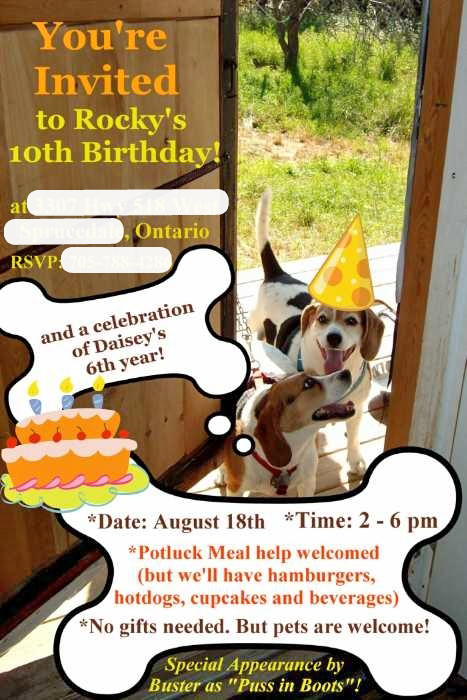 My tips come from hosting our beagle, Rocky’s 10th birthday. Although it was his 10th birthday, it was our first “official” doggy birthday party. 1) Pick a calendar date. Spring, summer and autumn are ideal seasons to host a dog birthday party (so your dog and doggy guests can get plenty of fresh air). But if possible, time the date of your event around your dog’s real birthday or when you first got your doggy – for extra-special timing. For example, we don’t know the specific dates of when our beagles were born, except that it was in the summer. So we like celebrating their “birthday” close to, or on August 20th. Why? August 20th is the date when Rocky (our eldest beagle) first arrived in my life. A special and life-changing day. 2) Think about who will attend (including other pets). Will you host a big family reunion (with the “star attention” directed to your doggy) or only invite immediate family and your closest friends? And, will you invite their dogs? Also, do you have other pets? If yes, can you include them in your special day? For instance, we have an orange tabby cat, Buster. He reminds us of the fairy tale character, Puss in Boots. So we had a “guest appearance” by our kitty, dressed up as Puss in Boots on Rocky’s birthday. 3) Choose the location: A dog park or your home? Let’s say you want to invite other dogs, but you’re not sure your neighbours will appreciate 10 barking doggy guests. Well, could a dog park be a good meeting spot for everyone? 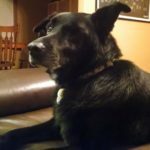 If yes, just be sure to see and share these tips on dog parks here. 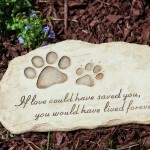 The other option is to host the event at your home – especially if you live in the countryside where there’s plenty of safe, outdoor space for your doggy guests to enjoy. Extra drinking bowls filled with fresh water. 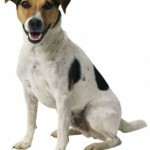 Use party “loot bags” and put dog biscuits inside like the Milk-Bone Mini’s brand with only 5 calories per treat. Bake a “dog bone shaped” birthday cake that doggies can eat! I found cake mix for dogs and a silicone cake pan in the shape of a “dog bone” on Amazon.com. 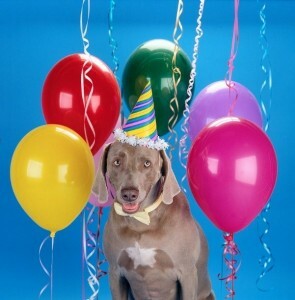 If you go to Amazon.com and search for “dog birthday party supplies” you’ll find tons of creative, pet-friendly ways to celebrate the day. Everything from pet birthday hats… a Puppy’s First Birthday scarf bandana… Happy Birthday dog cookies… and even edible birthday cards (called “Crunch Cards”) for dogs! Décor Ideas: A dollar store can uncover amazing treasure finds. I found “wrapping paper with paw prints” and “paw print stickers” at a local dollar store. How might these be used? 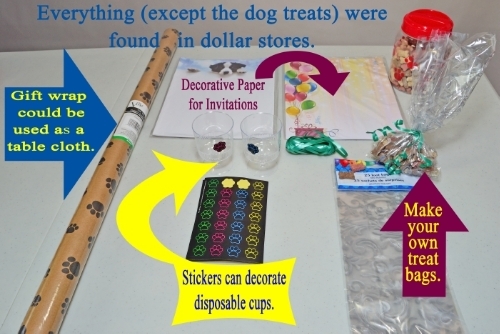 The wrapping paper could be used as a “table cloth” or “table runner.” The paw print stickers could decorate a plain disposable table cloth or decorate disposable cups. 5) Now it’s time to announce your dog’s special day. You can make your own doggy invitations using a professional service like Vistaprint.com (tip: search for “dog invitation”). Or, you can make invitations at home using decorative paper with a birthday theme or a dog theme. You could also turn a photo of your doggy into a “photo invitation.” Just look for a photo of your dog (or take a new photo) with some space to add text. For example, I found a photo of our beagles on our porch and used the space on the door to add text. To add the text, dog bone shapes, and other birthday graphics, I used a photo software program called, “ArcSoft PhotoImpression 6” at the time. On your invitation, add in details such as the date, time, location, ask for the R.S.V.P., and any other details you’d like to include. You can then print and mail the invitations. Or attach your photo invitation to an email message or social media message that you send out to your family and friends.